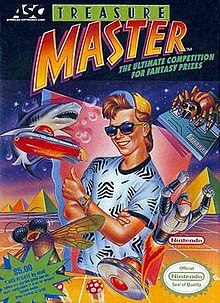 Treasure Master is a video game released by ASC Games in 1991 for the Nintendo Entertainment System as part of a contest involving MTV. After the game's release in late 1991, players had until 12PM EST on April 11, 1992 to practice beating the game. At this time, MTV revealed a secret password. By entering in this password and the game's serial number before beginning the game, players unlocked a secret sixth Prize World level. After this, players had until midnight to complete the entire game, including the Prize World. This prompted the game to reveal a 24-character code. By calling in to a special hotline with this code, players had a chance at winning one of 36,252 prizes. The game's music was composed by Tim Follin. The game's title screen music was actually a remix of the theme song to the Starsky & Hutch television series. This platform game-related article is a stub. You can help Wikipedia by expanding it. This page was last edited on 13 December 2018, at 17:35 (UTC).